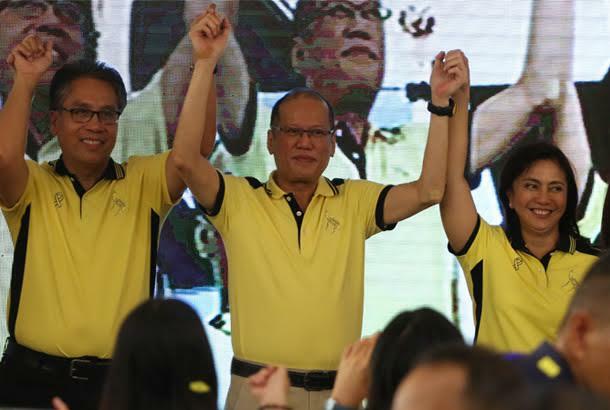 MANILA, Philippines - The administration coalition Liberal Party (LP) officially announced Monday, October 12, 2015 its complete list of senatorial candidates for the 2016 national elections. The 12-person senate slate was revealed at the event dubbed as 'Koalisyon ng Daang Matuwid: Ang Pagpapakilala' at the LP National HQ in Balay, Cubao, Quezon City. LP's announcement of senate slate should have been done last Friday but it was postponed due to Metro Manila Development Authority Chair Francis Tolentino's request to remove him from the line-up. Tolentino received criticism on controversial LP event in Laguna last month. Liberal Party is headed by former Interior and Local Government (DILG) Secretary Manuel 'Mar' Roxas II as its presidential candidate and Camarines Sur Rep. Leni Robredo as his running mate. "As senators, we have a role to play in helping in helping our people decide on whether we will go back to the old ways or move forward. Mr. President, with Mar and Leni, we are ready... We will proudly carry the torch that lights the way along the straight path," Senate President Franklin Drilon said. The Liberal Party is the oldest continually-active political party in the Philippines. It was founded by then senators Senate President Manuel Roxas, Senate President Pro-Tempore Elpidio Quirino, and former 9th Senatorial District Senator José Avelino, on November 24, 1945.